Some of you have said you couldn’t read the last post about the upcoming Massive Monday. “What does that even say?” you said. “What does that even mean! ?” you thought. We don’t understand the problem really but we thought we would spell it out for you (type it out so you can read it). On Monday 7th November we will be hosting the first Massive Monday of the winter season! We will have 25 problems that will resemble North Wales Bouldering’s most classic real rock problems! The winner of this Massive Monday comp will be the person who correctly identifies the most problems. Bouldering nerds get psyched! The comp will run from 5.30pm until 10pm. The prize will be a signed copy of Mr Panton’s bouldering bible. 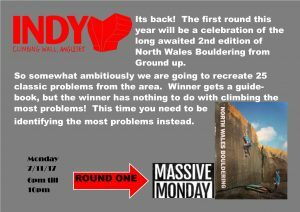 The problems will be going into the winter bouldering league, and we will be setting more problems for you all week!